CGPSC admit card released. 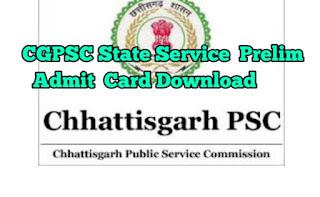 Recently Chhattisgarh State Public Service Commission, Raipur has issued the Admit Card of prelims State Service Exam 2019. The Candidates Who had applied for this exam now Can download their Hall ticket by just reading their details given as below. We hope you are aware how to download CGPSC admit card.